Posted: Thursday, April 7, 2016. 1:47 pm CST. 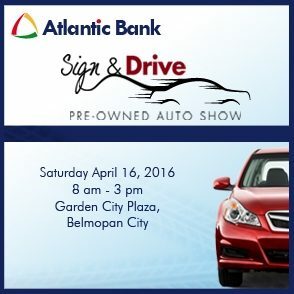 By BBN Staff: The Atlantic Bank Belmopan Branch is holding its Semi-Annual Pre-Owned Auto Show on Saturday April 16, from 8:00 am – 3:00 pm at the Garden City Plaza. Atlantic Bank encourages all its customers to take advantage of its unbeatable promotional interest rates, same day approval and 40% off legal fees. There will also be quality affordable vehicles available for viewing and for sale. Customers only need to bring a valid social security card or passport, a recent utility bill and a letter of employment. There will also be great food from Miss Deb’s Food 2 Go, as well as music and much more fun.